It sure wasn’t easy for HP to return to the smartphone market considering the company’s history of failure when it comes to releasing handsets. However, the Elite X3’s all-in designs sound like they make up a powerful smartphone. The new phone was showed off at the Mobile World Congress that takes place over the course of this week in Barcelona, Spain. As Park presented the sleek, phablet-sized handset, he also reminded people HP’s flagship ambitions. The Elite X3 is a “device that executives would carry,” he said. It’s large, but thin enough that it cancels out the possibility of a heavy feeling in the user’s hand (it weighs a mere 0.43 lb). The company’s pledge of developing a smartphone that makes “no compromises” surely seems to follow through in the shape of the Elite X3. Its texture graphite back offered an easy grip and in spite of its size (3.29 x 0.31 x 6.36 in), it still fits comfortably in one’s hand. The Elite X3 sports a Bang&Olufsen sound system fitted with active noise cancellation and dual front-firing speakers. 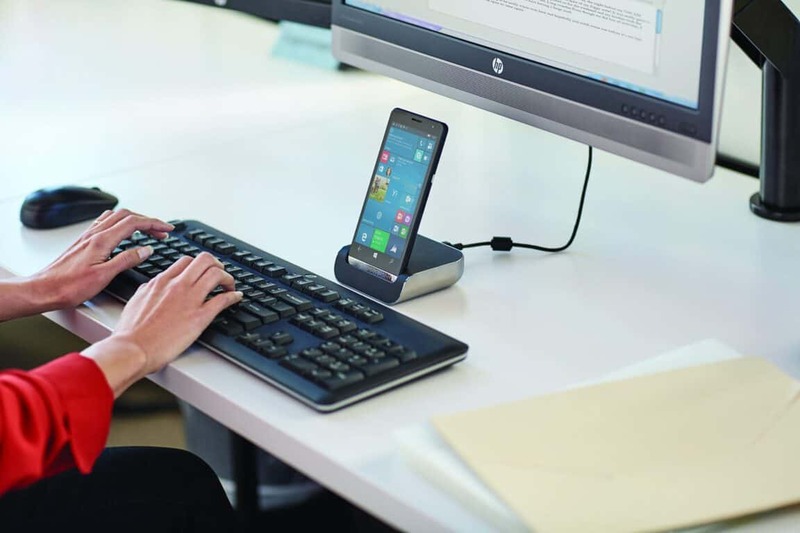 But the Elite X3 is not meant to be used on its own – it needs Mobile Extender and the Desk Dock to actually be using its Continuum capabilities. The Desk Dock resembles similar devices offered by Microsoft or Acer. While the dock wasn’t such a surprise, the Mobile Extender was unexpected addition, a laptop-shaped terminal that finally solves the problem of lacking a keyboard and a mouse when you’re on the road with your Windows phone. You can connect the Elite X3 to the Mobile Extender – either via one of its USB-C ports or wirelessly – and you’re all set with your somewhat-mobile computer. According to HP, the Mobile Extender has “no CPU, memory, or storage.” It has, however, a 4-cell, 46.5wH battery that will supposedly last at least three days in standby mode. After the spectacular phone fail that came with the ill-fated acquisition of Palm, HP has got a lot to prove. The company’s choice to sell the Elite X3 into the corporate space is, one hand a good thing: at least they’re not throwing one good phone after a bad one. However, people might not be very excited about their companies forcing them to use it, but maybe the Elite X3 will start growing on them as the IBM PC once did.